The archaeological site of Zominthos is located in the mountains of central Crete, the largest of the Greek islands and the fifth-largest island in the Mediterranean Sea. Crete’s geographic position in the southernmost part of the eastern Mediterranean and its natural environment played a definitive role in the birth, development, and character of the Minoans (ca. 3100–1050 B.C. ), the first European civilization. Mountains have been the Cretan people’s most precious resource since ancient times. High ones, such as Ida, are exposed to low temperatures and snowfall in the winter, while their peaks and some plateaus are covered in snow for most of the year. Mountains can be natural shelters for those who know how to exploit their resources such as water, the most important one for farming activities. It is therefore quite reasonable to assume that the wider region of Zominthos was occupied from at least the Minoan period to modern times. Two nearby cheese dairies, both of which have been restored, date back at least to the 18th and the 19th centuries. At the older one, Mycenaean artifacts have come to light. Over time, important geological factors—geomorphology, tectonic movements, the eruption of the nearby volcanic island of Thera, and the rise of the sea level—altered the natural environment of Crete to such an extent that the island’s historic course was affected. Additional factors, such as intensive agricultural cultivation, deforestation, and other human activities, resulted in a gradual change in the natural environment. 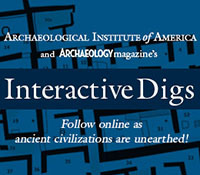 Minoan settlements and cemeteries, artifacts, and ecofacts reveal the evolution of a society that was not only influenced by foreign factors, but also managed its resources so well that it developed into a great civilization. The purpose of the multidisciplinary Zominthos Project is not only to uncover and study the site’s archaeological remains, but also to systematically investigate the relationship between the ancient people and their environment.